Syntax is the way words and phrases are arranged to make a complete sentence. It is also the rules that govern how sentences are created. A solemn consideration, when I enter a great city by night, that every one of those darkly clustered houses encloses its own secret; that every room in every one of them encloses its own secret; that every beating heart in the hundreds of thousands of breasts there, is, in some of its imaginings, a secret to the heart nearest it! - A Tale of Two Cities by Charles Dickens. 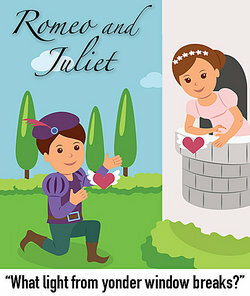 - by putting a verb at the end of the sentence as in Romeo and Juliet: "What light from yonder window breaks?" Where both deliberate, the love is slight:Who ever loved, that loved not at first sight? Now that you have seen these examples in literature, check out some examples of syntax in writing. "Syntax in Literature Examples." YourDictionary, n.d. Web. 19 April 2019. <https://examples.yourdictionary.com/syntax-in-literature-examples.html>.